Bud is now 18 months old and we are seriously considering a brother or sister for him. This has led me to really reflect upon Bud's birth and how I would want a future delivery to be different. On one hand Bud's birth was everything I wanted it to be but, on the other hand, there was one big issue and I am only recently realising that this has affected me quite deeply. I was convinced that I would go overdue with my pregnancy. He was my first baby, I had no 'shows' or false starts so I was a bit surprised when I went into labour! We had been at Red Rose Daddy's Brother's house celebrating his birthday, playing board games and generally having a nice evening, until about 11:45 on the Saturday night and came home to go to bed. I felt fine and had really enjoyed the evening. When I got to bed I just couldn't settle and kept going back and forth to the bathroom. After about an hour of this it started to dawn on me that this could be my waters slowly breaking. This was three days before my due date so I was quite taken aback, I had only packed my hospital bag that morning! I got up and went downstairs and, shortly, RRD came to see if anything was wrong. At 3am I got my first contraction and, very quickly they got closer and closer together. After about an hour, when they were about 5 minutes apart, I rang the hospital and they told me to come in. We eventually arrived at the hospital at 4:45am. When we arrived on the maternity unit I was put on the ward, to be monitored on a bed. They confirmed that my waters had broken and then I didn't see anyone for 2 hours. So, I was left, with my other half, wired up to the monitors on a bed, in pain. I couldn't move around which was driving me mad. No pain relief offered and I hadn't been examined. At the time I was quite surprised that the pain wasn't as bad as I was expecting. I don't quite know what I was expecting because, looking back, they were pretty bad! I lay on the bed for the whole two hours just getting through each pain whilst RRD sat feeling quite helpless and holding my hand through each pain. I probably should have kicked up a fuss and asked to be examined earlier but, first baby, this was all new to me. At 7am a midwife finally came to examine me and I was expecting to be told that I was only 4 or 5cm dilated and was not looking forward to a few more hours of the pain. I'd read all the books and knew that the first stage of labour can last up to 24 hours, especially in first pregnancies, so I wasn't hopeful. The midwife asked me if I was feeling pressure and told me I was fully dilated! So, zero pain to 10cm in 4 hours, I was so pleased. I knew that my maternity unit had a midwife-led Birth Centre and was really keen to deliver there so I was delighted to be asked if I wanted to go up there and go into the pool. The midwife also got me some gas and air which, to be honest, I couldn't really be bothered with as I had got that far without it. Within 15 minutes I was in the water. The pain was so much more manageable straight away. I quickly got fed up with the gas and air and abandoned it. After about an hour in the water I really started to want to push and the midwife agreed it was fine for me to do so. I've never worked so hard as I did when pushing during labour. Nothing prepared me for the sheer physical exertion of it. Bud's chin was down and this made pushing even more difficult as he would move down then move back up as I relaxed. I pushed for a long time and the midwife kept saying that, without progress I would have to get out of the water. I was determined that I that wasn't going to happen so every time she said this it renewed my efforts and I was able to push more and move forwards. Bud was finally born, in the water, at 11:17am on Easter Sunday morning. His shoulders got stuck after his head was delivered and he needed the midwife to manouevre his shoulders out. He was placed on my chest for me and RRD to discover that we had a little boy. I had been convinced that I was expecting a little girl and had told the midwives this so, as she lifted him up, she said 'here's your little girl'. I looked down and said 'we've got a little boy! ', actually he wasn't so little. Bud weighed in at 10lbs 5oz! I couldn't believe he was so big! From this point onwards it all went a bit wrong. Bud and I were still in the water while RRD cut the cord and there was a lot of blood in the water. 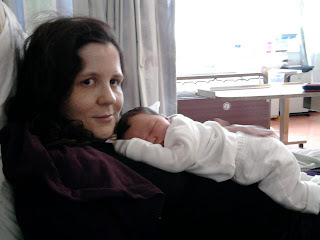 I was very tired and I didn't want the baby to be in the bloody water (angry new mummy) so told the midwives that we were getting out. Right now. One of them took Bud and gave him to his Daddy and then they both helped me out. There was a lot of blood then. A lot. I'd previously request that my placenta was delivered naturally but the midwives asked me to have the injection to deliver it, I quickly agreed. They also asked the Head Midwife to come in. It took them a while to deliver it but it was fine and they revealed that I had torn and I would need to have this repaired. I held Bud for about 20 minutes and then they took me off to the Delivery Suite to be examined and to have the repair done. I spent the next three hours away from RRD and Bud. The doctor examined me and said that I needed to go to theatre. From that point onwards I lay in a room waiting for a space in theatre. I was very tired and was trying to sleep but, really I think I was in shock. The midwife from the Birth Centre stayed with me and she was fab but, bizarrely, it didn't occur to me to ask for Bud and RRD. Looking back I don't know why they couldn't have come down to be with me when I was waiting. We were separated for far too long and that makes me so sad now. Eventually I got into theatre, had my spinal block and had my stitches. The staff again were fab. I remember having a really in depth conversation about marathon running with the anaethetist who held my hand throughout the procedure. I was then taken to recovery and finally reunited with Bud and RRD. Red Rose Daddy had been left with the baby to get him into a nappy and dressed. Bud greeted him by poohing all the way up his arm! He wasn't kept informed by the medical staff and was so worried about me. He was also trying to keep our families informed but had nothing to tell them so more people were worried. Both sets of our parents wanted to come and wait with him but, he says that he was conscious of how little time we had spent together as a family and wanted me to spend some more time with Bud first. From this point onwards it was fairly straightforward but I did have two more instances of unnecessary upset. The first came when one of the Healthcare Assistants came to empty my catheter pot where she tutted and said 'what a mess', well, excuse me for having no control over my bladder at the moment! The second was around breastfeeding. I was determined to breastfeed Bud and kept asking for a midwife to come and help me with him. I must have asked 4 or 5 times and, eventually, at 11pm someone came and he fed. I was in tears by this point as I was convinced my baby was starving. To be fair he had slept most of the time so he really wasn't but you instinctively want to feed your child and, because of the spinal block, I needed help with this and it wasn't forthcoming. I mentioned before that is was Easter Sunday and the maternity unit was really busy. The midwives were generally lovely and did an excellent job. I had a breastfeeding session with a Healthcare Assistant who specialises in supporting breastfeeding the day after Bud was born and she was so helpful. She supported the start of my breastfeeding journey (that's another post) and without her I might not have managed, she was a great resource. Nothing prepared me for the physical impact of giving birth. I pushed for a long time and every muscle in my body felt strained, that and the after effects of the tear meant that I was incredibly sore and fragile but I was able to stay in for 2 nights and this really helped. I have never been so glad to get home than the day we brought Bud home from hospital and started our new life together as a family. As I mentioned, we are really thinking about a new baby and I am really quite scared that I will tear again and be forced away from my baby again. It isn't the pain or the tear that I am worried about but I've realised how upset being away from my child for so long made me and I really don't want to go through that again. Next time I will be far more opinionated, strong willed and will know what to expect and I will definitely be telling the staff what I want. RRD will, I think, be more forceful too. If I need to go to theatre then the new baby and RRD will come with me as far as possible and I will try to feed as soon after delivery as I can. Only with hindsight and knowledge can you come to a clear understanding of your birth experience and writing this post has taken a while but has really helped me I think. 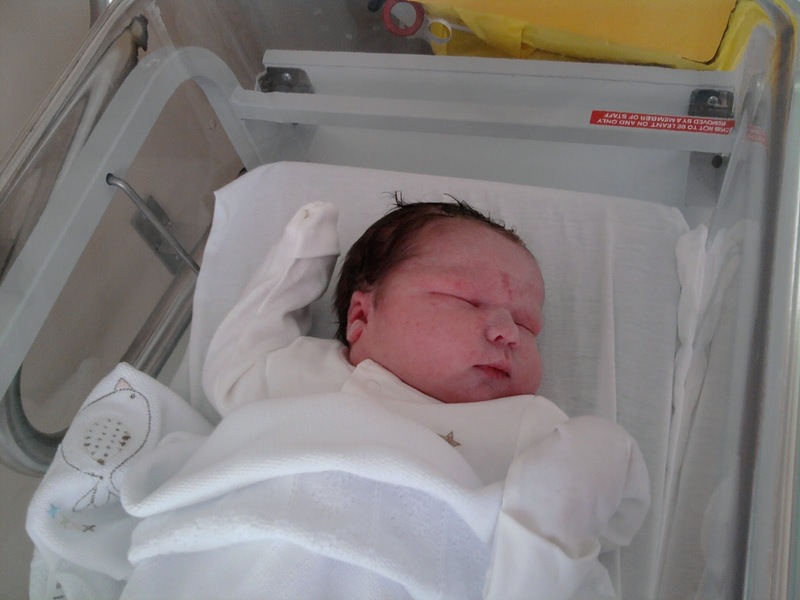 I have submitted my birth story to Actually Mummy's Birth Story link-up. Click here to add yours or read more.